The Long Island Aikikai offers classes in the classical style of Musō Jikiden Eishin-ryū Iaido as well as the seitei Iaido curriculum of the Zen Nippon Kendo Renmei (All Japan Kendo Federation). We are one of only a few martial arts school in the New York area to offer such instruction. Musō Jikiden Eishin-ryū is one of the most widely practiced schools of the Japanese martial art of Iaido in the world. This school has an unbroken history of about 450 years and dates back to a time when when proficiency with a sword meant the difference between life and death for the Samurai. Essentially, Iaido is a Japanese martial art dealing with the practice of sword techniques. Iaido utilizes various drawing, cutting, thrusting and resheathing movements that are performed against imaginary opponents. 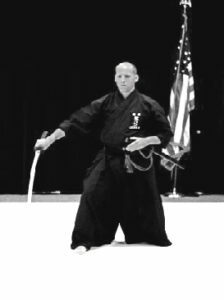 While the theories and techniques of Iaido do have real-world self-defense applications, it is more a vehicle to sharpen concentration and improve one’s capacity to focus the mind. The word “Iaido” loosely translates into English as, “the way of unified presence” and is often thought of as a form of Zen training.